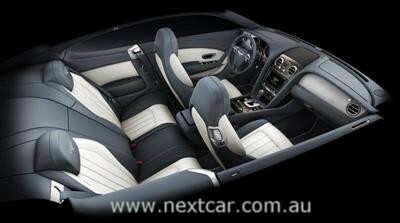 Two new Bentley Continental V8 models will be unveiled at the Detroit Motor Show in USA next month. The new 4.0 litre, twin turbocharged V8 Continental GT coupé and GTC convertible expand the brand's presence in the high-end luxury sports car sector. This remarkable, new Bentley V8 engine delivers maximum power of 373 kW (500 bhp/507 PS) at 6,000 rev/min and an extraordinary peak torque of 660 Nm (487 lb ft) which is available across virtually the entire rev range from 1,700 to 5,000 rev/min, providing exhilarating performance and effortless power delivery in the Bentley tradition. Combined with a new close-ratio 8-speed automatic transmission, this translates into an about 5 second acceleration time for the 0-100 km/h (0-62 mph) sprint and a top speed of over 290 km/h (180 mph). At the same time, the new V8 Continental models achieve outstanding levels of fuel efficiency and CO2 emissions for the luxury performance sector and are capable of travelling over 800 km (500 miles) on a single tank of fuel. 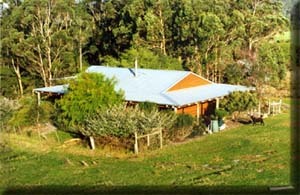 Full and official figures will be released in early 2012. 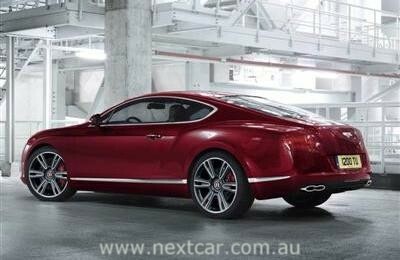 The new V8 engine will be available in two models; the Continental GT and the Continental GTC. 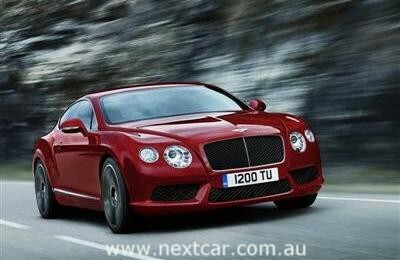 Expressing their potent 'character', these models are distinguished by a black gloss matrix grille with chrome frame and centre bar, a red enamel Bentley ‘B’ badge, and a black matrix three-segment lower front bumper divided by distinctive body-coloured strakes. At the rear, unique chromed ‘figure eight’ exhaust tailpipes, a dark lower valance and red enamel ‘B’ boot lid badge emphasise the sporty, contemporary identity of the new V8s. The two new Continental models will be offered beneath the flagship 6.0 litre, 12-cylinder engined Continental GT and GTC, which continue to excite customers with a combination of silken refinement and the ultimate power of the twin-turbocharged W12 Continental engine that, in its most potent form, delivers an astonishing 631 bhp (640 PS).